Your first encounter with the expansions of Cities of Splendor leads you into the cities themselves. Bruges, Lyon, Lisbon, Seville, Venice, Florence, Pisa—each of these cities has much to offer for a master jeweler who can win the city’s patronage. But with so many jewelers vying for attention, only the truly extraordinary can win a city to their side. In The Cities expansion, the noble tiles from the original game are replaced with new, double-sided city tiles. Like nobles, these cities have requirements that must be fulfilled before you can claim the city. Unlike the noble tiles, however, to win the game with The Cities expansion, you must claim a city! Naturally, you’ll be competing against your opponents to be the first to claim a city—and if another player is going after the same city as you, you’ll need to be ruthless if you’re going to gain the upper hand. The second expansion in Cities of Splendor sets you on the first part of your journey to the East. With the discovery of sea routes to India, each guild is racing to establish new trading posts. Here, there are new rules to the gem trade, and every player will need to keep an eye on their adversaries as they race to the finish! The Trading Posts expansion from this box adds to the engine-building aspects of Splendor by introducing the Route to the Orient board. This board offers unique powers to the players… provided you can unlock them by collecting the appropriate development cards. You may gain more prestige points, the ability to accelerate your game by claiming more gems, or even stranger abilities. Just take care that you don’t become distracted by these new powers and lose sight of your end goal! You’ve finally arrived in the Orient in the third expansion of Cities of Splendor, and a world of new possibilities has opened. These countries are opening their borders to trade with Europe, and there is plenty of wealth to be made with these new development cards. 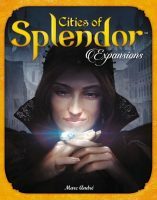 As every merchant guild expands outwards, the stakes are raised in the final expansion of Cities of Splendor. With the major cities of Europe establishing trading colonies, tensions are escalating, and even merchants must build strongholds to protect their wealth from their rivals’ ambitions. More than any other expansion in the Cities of Splendor box, The Strongholds enhances the interaction between the players with the addition of stronghold pieces. After you purchase a development card, you can choose to either place one of your strongholds on the board or to remove an enemy stronghold from the board. While your stronghold is on a card, only you can purchase that development card—and if all three of your strongholds are on the same card, you may have the chance to claim it by right of conquest! By enhancing the combo aspect of the base game, The Strongholds invites you and your fellow players to engage in a tightly wound battle of wits. Add a Review for "Cities of Splendor"